24 Volumes were listed in the original prospectus, while displaying a picture of only 18 volumes. The prospectus pictures do not agree with the as published volume numbers. Some titles pictured in the prospectus were never published. Brown leather, marbled endpapers, all edges gilt. 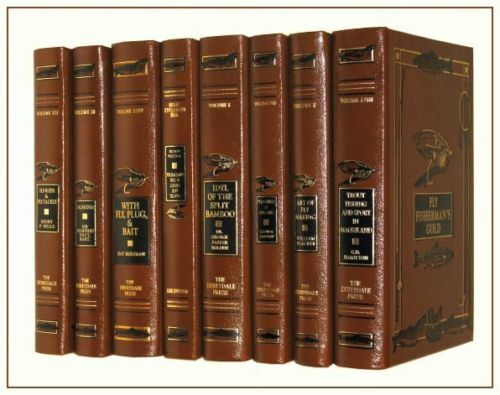 Not mentioned in any of the Derrydale Press bibliographies are the reprinted hardcover volumes from the Derrydale Press in the late 1980's and early 1990's Stated limitation of 2500 copies each. Leather bound books with AEG. Many have an attached ribbon page marker. A Limited Edition of Two Thousand Five Hundred Numbered Copies printed by Douglas C. Mauldin at The Derrydale Press in 1991. Signed by Dr. Loren Grey, son of author Zane Grey. Ten titles, bound in leather, with raised bands on the spine, with silk ribbon bookmarkers, all edges gilt.